Can you tell me more about the use of hard foam rollers for SMR? Also, has there been any positive feedback as to the use of therapy balls, body bolsters or soft rollers? Thank you for your question. There are some very good articles on the site on the rollers (see “related articles” at right), but as far as contraindicators go, a lot of this is done through a better understanding of the function of the body. The roller is used as a tool that can release tension in the myofascial system (muscle and fascia). This can be caused by many things: stress (chemical, physical, emotional or psychological) impact or trauma, repetitive movement patterns, poor exercise conditioning, poor hydration and diet or bad posture. Combine the roller with some of the new mobilizers from the PTN Exercise Library, and you will get some fantastic results for your clients. As far as the types of rollers go, generally all foam rollers have a different consistency. There are variations across the board of density of the types of foam due to the manufacturing process. Obviously, "softer" rollers are less intimidating to the "pressure" points of the myofascial system. Any release of the myofascial system is a positive, so if your client finds the softer rollers beneficial, that is great. They will be more likely to use them and therefore help the body help itself! I hope this has helped answer some of your questions. 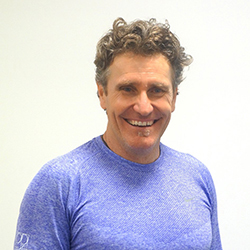 Ian O’Dwyer, (OD), has practiced in the health and fitness industry for over 25 years. He is a director of OD on Movement, a movement and business solutions company with two facilities in Australia (Melbourne & Noosa). OD is a “hands on” Movement Coach practicing at his facilities. OD on Movement run Mentorships twice yearly in Noosa Heads and also in dedicated locations globally. As an Author, Ian has written for leading industry magazines and education providers, he is also a Co-Founder of PTA Global, whom in 2009 collaborated with 25 of the industries leaders to create systems, science and tools for Coaches, Trainers and Businesses to gain more successful outcomes for their clients. As a Presenter, Ian has presented over 500 workshops globally. He has a unique ability to observe movement and create instant change through innovative and practical techniques but best of all he makes it FUN. Ian is a common sense, positive guy who has worked with and learnt from some of the world’s best to become an effective and successful coach. Muscle Tightness: Cause or Symptom? SMR Issues: Tired or Bruised Muscles? Tissue: Do You Really Know What You Are Training?